I have a lot of DWG files like basemap, and water and wastewater network. I am looking for a way to import these files into my QGIS project. You can convert the DWG files to DXF (which QGIS does support) using the Teigha® File Converter. It's a free (not open source unfortunately) cross-platform application provided by the ODA to end users only for the conversion of .dwg and .dxf files to/from different versions. 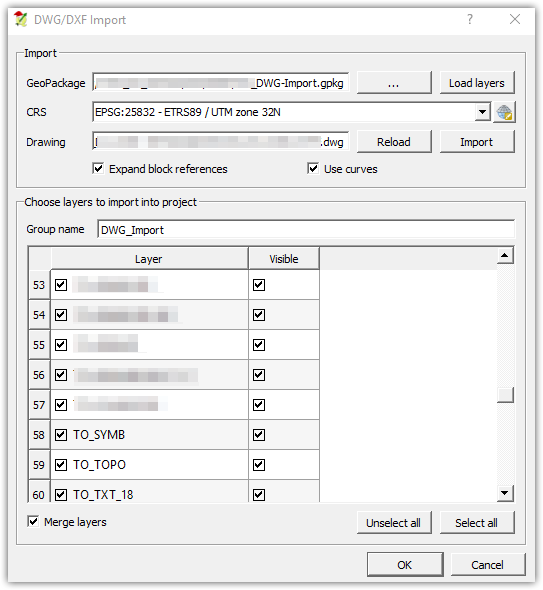 In the newer versions of QGIS (2.18+) there was a feature implemented to import .dwg-files into geopackages (.gpkg). The tool will try to represent the CAD-drawing as close as possible with some limitations on annotations, labels and hatches. It depends on what you mean by import. Do you want to import data to actually do something with it, or just to have a background layer for viewing? 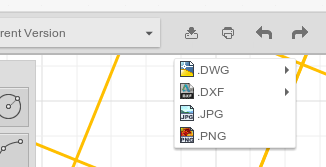 ArcGIS for example does a pretty good job of displaying (and even allows limited editing) of DWG/DXF files, while other GIS software packages attempt to simply import the data as best they can, because the contents of a dwg file can be too complex to have a tool that would simply translate CAD -> GIS. I often recieve cad files but I don't have AutoCAD, so I break them down with DoubleCAD XT which is a free download. I export each layer or set of data by selecting it then SAVE AS (toggle the selected option) type = DXF-2004-2006. These seem to import fine into QGIS, when you open it up as a vector layer. but I find the layer by layer approach with DoubleCAD to be more robust. point data - export via mmqgis plugin 'export geometry' to a csv. vectors - save as dxf, then resave in DoubleCAD to a dwg. You cannot keep the attributes so you have to work with one feature of data at a time. As many have said open source software can not support dwg. Dxf however is supported and autodesk provides a cloud tool that you can use to convert dwg to dxf: autocad 360 (or the previous version autocad ws). The advantage of this tool over many others is that it support all versions of dwg, also the most recent ones. Add the files and then under download you can download the files as dxf as well. DWG is a proprietary, closed format. As many would be able to confirm is one of the less interoperable formats. Long story short: it is not possible to open a DWG file with an Open Source software/library. There are/were attempts to create an OS library to read dwgs but afaik they don not work very well. If there is software other than Autodesk that can open DWGs then it uses a non open source library to do that, for this reason you will not see DWG support in QGIS. As already suggested ask to have the DWGs saved as DXF (that is somehow more interoperable) or as shapfiles (Autocad map can do that). Open Source QCAD does simple and smooth conversion job from .dwg to .dxf format. Use the "add vector layer" feature in QGIS 2.0 to import the .dxf file. However, at this point of time I note that with the 32 bit QGIS version, it can only save as to a .kml file but with the 64 bit QGIS version, it can save as a .shp file. Dispose unwanted features in the .shp file with the rectangle, polygon, radius or freehand selection whichever you may prefer. Open Source gvSIG is said to capable of opening DWGs. From there, it should be possible to export to shapefiles. Not tested here I'm afraid. The latest version of qgis is capable of importing dwg files. Not the answer you're looking for? Browse other questions tagged qgis dwg or ask your own question. Converting .dwg to .shp using QGIS? Importing DWF files into QGIS? Why are some CAD lines invisible in ArcMap? Can FME georeference dwg CAD files? Can I use .crd and .dwg files as QGIS data sources? Create kmz file out of Illustrator maps? Converting from dgn to shp or dwg files using QGIS? Where can I find a GDAL distribution with DWG support? Publishing AutoCad *.dwg files into HTML? Exporting to DWG using QGIS?